On one of the coldest days of the year I declared a snow day for myself. I stayed at home in warm woolly long johns and decided I wouldn’t work. But I would still do the daily ritual of saying good morning to my ever-growing list of departed souls. And I still had to tend to the routines of feeding and walking the dog, dealing with meals and vitamin regimens, checking the water chlorination system, fetching and sorting mail, paying the multitude of monthly bills, phoning to check on various people in my life, and figuring out which appointments I could cancel from this one day of the tightly-scheduled week. Life is complicated. Crammed. It’s filled with routines and responsibilities. Whether or not I work, my time is consumed. Space is consumed as well. The piles of possessions, books and papers, the wardrobes of my own and my dog’s, the pillows all over the house for bolstering my bad back, the leftover belongings of my daughter who died and my son who now has his own home, the parts and pieces of projects that beg to be completed… the accumulation of stuff. Maybe that’s why I like to travel. Leaving home, I pack only what can fit into one rolling suitcase and one carry-on bag. Traveling limits the amount of physical things I have to contend with. And it detangles my time. During vacations, my life is deconstructed, like the salads I make for my friends, with just a few delectable items carefully splayed out on a white plate. Back in November, on my first full day in Australia, I followed my tour group to the Old Melbourne Gaol where there were rows and rows of inmates’ cells. I stepped into one empty cell and shut the door on the noise of life. 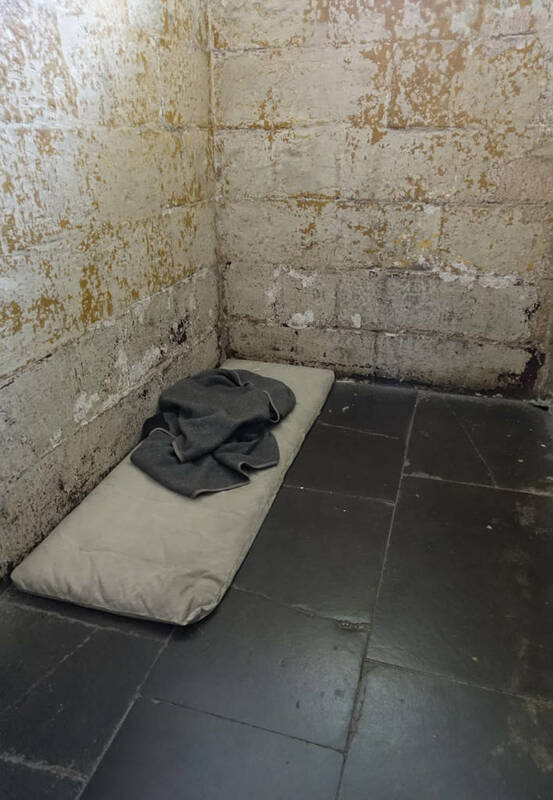 Squatting on the floor, I tried to imagine sleeping there countless cold damp nights with only a thin horsehair mat and scratchy blanket. This was once some criminal’s home, I reminded myself. Someone lived here, sandwiching his weary bones between a mat and a blanket. Life beyond that had to be drawn from whatever warm thoughts the prisoner had stockpiled in the depths of his mind. Alone in the cell, my thoughts wandered to the peeling paint on the walls. Which made me remember my bathroom project that needed patching. Which took me back home to the dog, the bills that would not be paid while I was traveling, the people waiting for my calls, …the friends eating salad without me. And the ones I love. What makes life complicated? Is travel an escape from routines and responsibilities? This entry was posted in 2018 and tagged accumulating stuff, cluttering your mind, life is complicated, routines and rituals, snow day, stockpiling, traveling to escape on 2018/01/23 by Robin Botie.